Material design is a quite young and refined design concept in the Android smartphone and many of the developers have started to implement this concept in their applications. But, if you are a startup or a busy designer, then creating a completely new design interface for each of the app is not as easy as it sounds. In this case, using a pre-built UI design is always a smart option which can drastically cut down your efforts and time. So, we have created an amazing FREE Android material design UI kit which is made in Photoshop and can be edited according to your project if needed. It includes all the necessary UI element that you may need to design a beautiful and attractive design interface for your next mobile app. 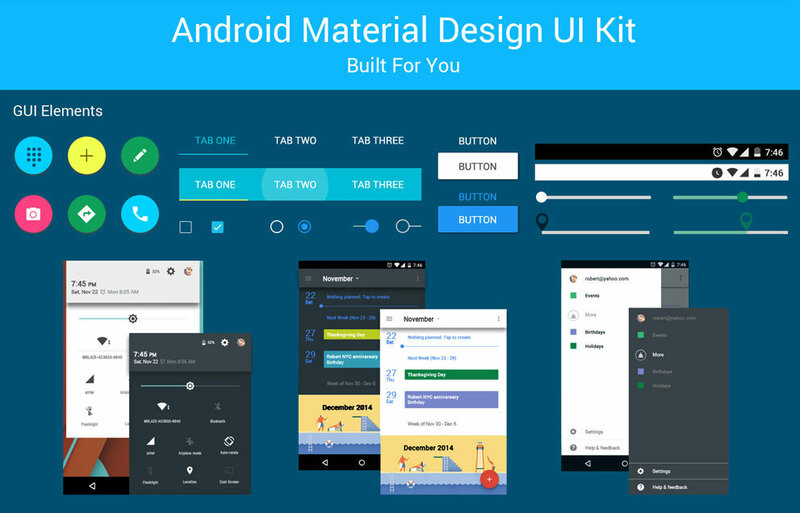 This amazing Android material design UI kit is completely free to download and well organized in the layered PSD format so that you can make any changes in any of its UI elements. The UI kit is created by the expert web designing team of Nine Hertz and includes various visual effects and design elements such as menus, icons, buttons, event view, navigation bar view, receive call view and many other GUI elements. Download this fascinating Android material design UI kit and feel free to use it in any of your commercial or personal projects.